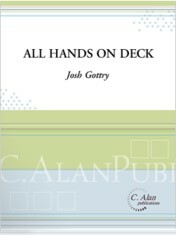 Featuring nine pieces – three duets, three trios, & three quartets – each playable on cajons, congas, djembes, or any combination of the three, All Hands on Deck is a flexible collection of hand drum ensembles that is ideal for many different contexts and applications. Double, triple, or quadruple parts for larger ensembles, or utilize with a small group of students in a private studio or school ensemble breakout situation to introduce basic hand drum techniques and sounds in an ensemble setting. A full page of short exercises, performance/program notes for each piece, a notation guide, and a detailed explanation of the strokes/sounds is included and will provide a solid foundation to effectively study and perform each of these pedagogical and engaging ensemble compositions.